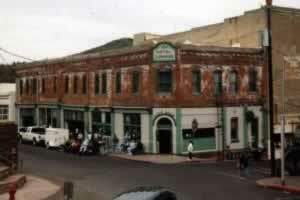 Jerome, Arizona has approved an ordinance recognizing gay and lesbian couples with civil unions. Jerome is the second Arizona city after Bisbee to adopt such a law. Mayor Nikki Check sponsored the measure. Arizona voters in 2008 approved a constitutional amendment defining marriage as a heterosexual union. Attorney General Tom Horne threatened to go to court to block the start of Bisbee's law unless the city omitted language in conflict with the state's definition of marriage. The city removed a line which granted couples in a civil union the same responsibilities and benefits as married couples. The current ordinance states that couples may file contractual statements in matters such as inheritances, property ownership and children. In its 1920s heyday, Jerome was home to more than 10,000 people, most of whom worked in the city's rich copper mines. As of the 2010 census, Jerome's population was 444.